African National Congress (ANC) President Cyril Ramaphosa addresses supporters during the Congress' 106th anniversary celebrations, in East London, South Africa, Jan. 13, 2018. The new leader of South Africa's ruling African National Congress (ANC) party, Cyril Ramaphosa, has said the question of whether President Jacob Zuma should step down would be addressed "as time goes on." 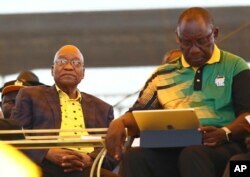 There has been widespread speculation that Ramaphosa and his allies are lobbying ANC members to oust Zuma as head of state in the coming weeks, but he made no mention of Zuma's future in a closely watched speech on Saturday. Ramaphosa won the race to succeed Zuma as ANC leader last month, narrowly defeating former Cabinet minister Nkosazana Dlamini-Zuma, Zuma's ex-wife, in a bitter leadership contest that had threatened to split the 106-year-old ANC. In the interview to South Africa's eNCA television station, Ramaphosa said the issue of whether the ANC would push for Zuma to step down as president "will be dealt with, you know, as time goes on." In a statement issued in response to the interview, South Africa's presidency said Zuma and Ramaphosa had agreed to hold regular meetings "to ensure synergy between the governing party and government." Ramaphosa said Zuma was a "deployee of the ANC" and that the ANC "dictates to all of us." He added that he knew South African people were impatient for change but that "we should not humiliate President Zuma." Zuma, who orchestrated the removal of former president Thabo Mbeki in 2008 after succeeding Mbeki as ANC leader, no longer holds a top ANC post. Zuma's presidency, tainted by corruption accusations which he denies, has tarnished the image of Africa's oldest liberation movement and seen the economy slow to a near-standstill. Markets have rallied since Ramaphosa's election as ANC leader in December, as investors have warmed to his promises to root out corruption and kick-start economic growth. Any sign that Zuma could step down before his second presidential term ends in 2019 has tended to lift South African assets, including the rand currency.